This model was recreated in LDD by Eurobricks user @Stephan, which I then took and recolored in my red and gray color-scheme. I also added the opening cockpit from my older rocket model along along with new tail-fins and two less rocket stages. 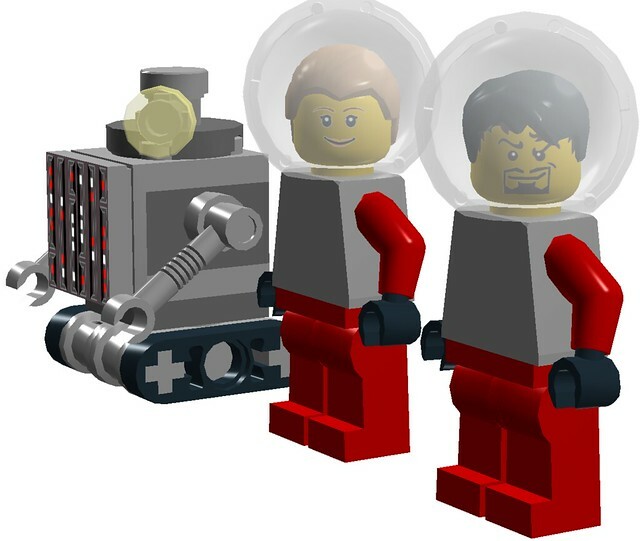 The two astronaut figures and one robot are also included in the LDD file! 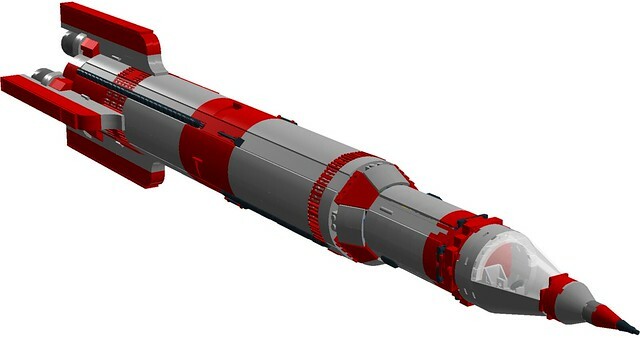 NOTE: Some parts would not fit on the rocket according to Stephan due to tolerance issues in LDD, and are left to the side in the file. They are hidden in the pictures, but they are there, so be alert when building in real life. You have been warned! This ship is the forerunner for all of the other Lego space ships: in 1970, this crucial piece of history launched from LegoLand Space Port for a mission to the moon. This was very soon after the failed 1965 launch of 801 series Space Rocket, which killed the the brave crew of Kat Aclysm: female rocket science genius and designer of the experimental ship, and Abraham "Abe" Normal, the best test pilot in the academy. Their deaths at the Samsonite launch pad were not in vain though, as the newly founded LegoLand Aero-Space Authority (renamed Classic Space Command in 1978) rebuilt their reputation as the premier brick-built space agency by launching the "Innovator", also known as LL001 which in early August 1969 made history as the first mini figure - built object on the moon! This rocket and it's crew (Bill Fold, Penny Wise, and S1L-V3R the robot) made history with their two days on the moon's surface, providing the foundations for the Classic Space Moon-base series of missions. The model still separates into sections, but the top most one of these has been replaced, thus reducing the segments to three. The rear of the rocket features five engines, the middle section a smaller bank of five thrusters, while the cockpit section has one singular engine. The cockpit still opens, and as usual should feature this print. The rocket features enlarged tail-fins inspired by 1950's / 60's science fiction. The fins SHOULD be able to take the weight of the rocket when standing vertical, but I'm not 100% sure, so build at your own risk. You have been warned! The height of the Saturn V dwarfs the smaller rocket of the previous design. The robot is inspired by the robot customer in the 2007 set number 4981 (a Spongebob set called The Chum Bucket), while the astronauts were inspired by the Sandy Cheeks mini-figure in set 3831 (Rocket Ride). The astronauts should have this print on their torsos. Here is the LDD file for the modified Saturn V, which also includes the two bubble - helmeted astronauts and the robot. The model is 100% build able in real life, and should be built by me around Christmas this year. Comments, questions and complaints are always welcome! EDITED 8/8/17: added new pictures and updated ldd file! I just added new pictures and updated ldd file. 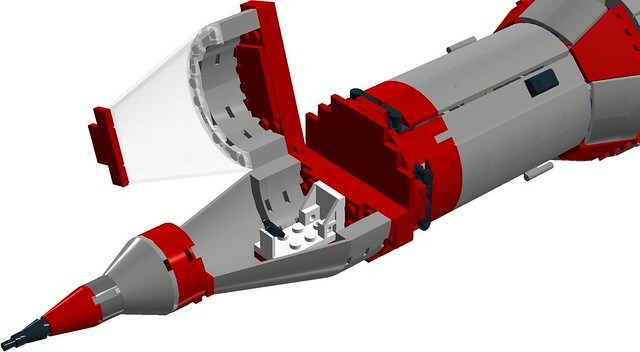 The rocket now has enlarged tail fins, different first-stage engines and a revised nose cone. Enjoy! I really dig the slopes and arches used at the front of the tailfins; its a simple mod, but it makes for a nice retro rocket. Something I want to suggest, maybe you should have two transparent canopies instead for the pilot's cockpit; and perhaps as a fun hypothetical play feature, you could make the pilot's seat rotate with a turntable plate and something weighted to keep it level with the rotation of the rocket.